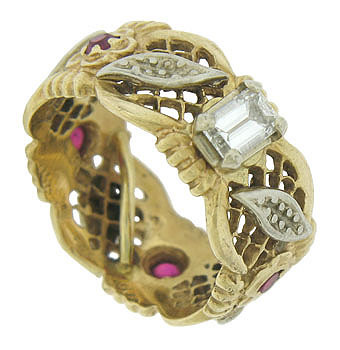 This romantic 14K yellow gold antique engagement ring features lattice filigree and engraved flowers. 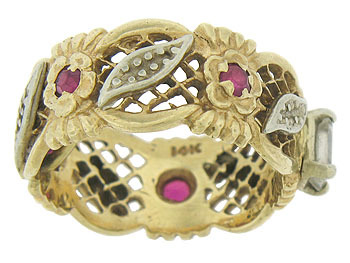 The cutwork flowers are each set with a single round cut ruby. 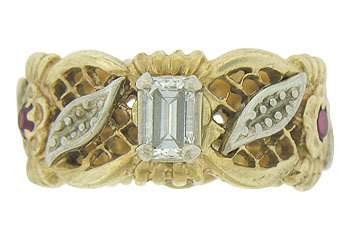 A dazzling .20 carat, H color, Si2 clarity, emerald cut diamond is set amidst a pair of twisting white gold leaves that float across the rings surface. 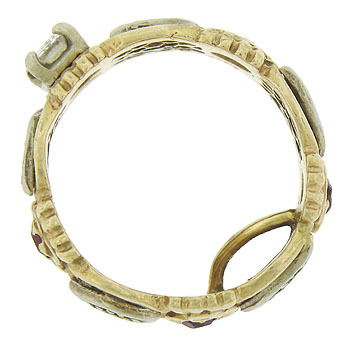 The ring measures 8.38 mm in width. Circa: 1930. Size 3 1/2 - 4 (shown with a sizing bar that can be easily removed). We cannot re-size.